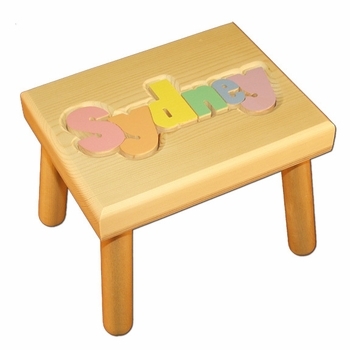 Kids love puzzles, especially when it’s a part of their very own step stool seat! This unique gift idea is great for welcoming new babies to the world, birthdays, and holidays. The seat stands 9 inches off the floor and the seat dimensions are 9 by 12 inches. It is made in the USA of high quality solid wood and is built to last a lifetime. Finishes are all water based and non-toxic. For an extra personalized touch, you can add an engraved message or the child's birth information on the bottom of the seat. See More Images above to see detailed photos of the engraving option. Also, please note that the engraved area under the stool has a limit of 9 lines of text with a maximum of 30 characters per line and an overall total of 300 characters including spaces. Click here to see the larger stool. What a great little stool! You guys are awesome!!! The baby seat arrived yesterday and I just had to open it before wrapping it for the shower. All I can say is WOW...it looks beautiful! You can tell right away that this is a sturdy piece of furniture and the letters fit perfectly on top. I can't wait to see the reactions when they open it...they are going to love this gift!